Last week, a casting call for Fox’s upcoming X-Men: Dark Phoenix made its way onto the internet and dropped a few hints about which new mutants are going to be in the film. The roles were listed under production names to keep their identities hidden, but now we know that “Brittany” was code for Dazzler. According to Entertainment Weekly, Dazzler will play a “small role” in Dark Phoenix as a follow-up to her painfully small almost-cameo (as an album cover) in X-Men: Apocalypse. Back when it was first rumored that Dazzler would appear in Apocalypse, the internet somehow got into its mind that Taylor Swift should play her after Swift made a random visit to the movie’s set during production. There are a number of things that Dazzler and Swift have in common, like being blond, famous, and starting very public feuds with former friends. But Dazzler isn’t just any old regular pop star; she’s the most famous openly-mutant performer and an cultural icon in Marvel’s books. Most importantly, though, Dazzler can dance. Swift made an entire music video about how she cannot. 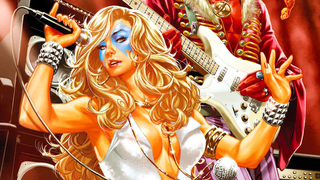 When I reached out to Daily Beast entertainment writer and self-professed Dazzler stan Ira Madison II about who should play Dazzler, he answered back with a triple threat.